The Honeydoo case is available for $75.00 US. 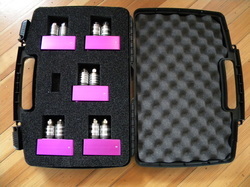 The cartridges fit snugly in the custom cut, heavy duty foam slots. It measures 16 1/2" wide and 13" long. The handle has two snap locks. Fully loaded with cartridges, it will weigh 10 lbs. Protect your investment with this beautiful case.